Greta Delleany, born in London, studied first at the Westminster School of Art and then at the Royal Academy under Walter Sickert, the noted British Impressionist who was to have an important influence on her art. Sickert’s masters were Whistler and Degas, and Delleany’s pastoral landscapes in delicate pastel show a clear affinity to all three of these important artists. Between 1913 and 1940 she exhibited in sixteen exhibitions at the Royal Academy and also showed frequently with the Royal Society of Painters and Etchers (of which she was made an associate in 1919), and at the Walker Art gallery in Liverpool. For a period of time she worked in New York City and San Francisco and was a member of California Printmakers. She taught for many years at the Cheltenham College of Art and eventually served as its principal. 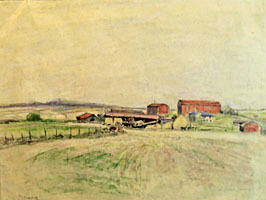 Inscribed, lower right: "Waterloo, 1941"